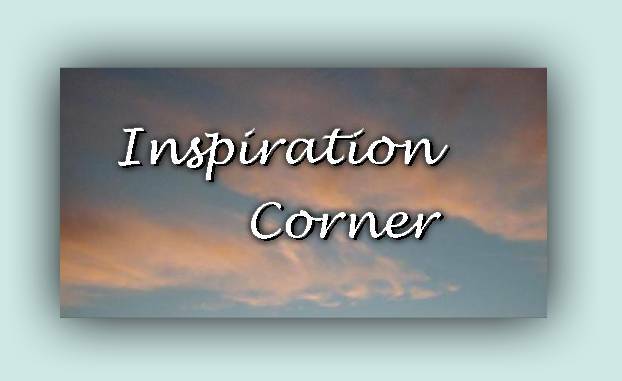 work to be posted on Inspiration Corner, please contact me. I'm always looking for new submissions. Curious about God, Jesus and how to go to Heaven? Start here. Are you absolutely certain that you are saved and going to Heaven? Check out the article Are You Saved. Here is a somewhat poetic look into what Heaven might be like. God's Mansion. Do you think you are a good person? Do you think being a good person will get you into Heaven? Then take the Good Person test. Do you wish to be saved? Then check out this Salvation Prayer. Things to help you share your faith with others. Here are the Bible verses I use when I am trying to tell others about Jesus Christ. Along with each verse I explain why I like it and how I use it. Are you going to Heaven? Are you Sure? Want to know for sure? Then check out the article "Are You Saved?". Things to spiritually encourage and inspire. During a particularly difficult day at work, one of my coworkers gave me this sign from God. Here is an image of God's hand. Well, it's really artwork of God's hand, created by God's hand. Things to help you build and strengthen your Christian walk. Want to improve your prayer life? Then check out this Bible lesson entitled Prayer Improvement. This was originally used to teach a Bible lesson about prayer to an adult Sunday School class. Is it okay to tell other people about good things you've done? Is it okay to tell about good things others have done? Here is a Bible lesson entitled Not So Good which addresses these issues from a Biblical perspective. Sometimes you just need to laugh a little. Here are some pictures of amusing church signs--enjoy! Do you say grace before eating? Here are some amusing ways to say grace. Here is a funny Email response sent by a supervisor to an employee who dared mention God in a company Email. Here's how you know that you attend a country church. Youth pastor Mike Eaton tells an hilarious story about a youth canoe trip. Recorded 7/20/08 at Bethel Baptist church. Hell's Best Kept Secret A wonderful sermon from The Way of the Master. Three Minutes to Live A sermon about witnessing from The Way of the Master. Unexpected A Christmas sermon by Pastor John Bouquet who talks about the many unexpected things we generally don't notice about the birth of Christ. This sermon is very different from any other Christmas sermon you've ever heard. This sermon was originally presented December 23, 2007. Assisted Suicide A very different and thought-provoking perspective in a short clip taken from one of Pastor John Bouquet's sermons at Bethel Baptist. Witnessing A one minute audio clip of Ellie Lofaro discussing telling others about Christ. Really makes you think! Clip taken from the Focus On The Family podcast which is a great podcast I highly recommend. Be sure to check it out. Have you ever had times when things went wrong and made you angry, upset or impatient? Listen to this short sermon clip and you may start to feel differently about times like those. Clip taken from one of John Bouquet's sermons preached at Bethel Baptist Church on 4/4/10. Here is a very interesting audio file explaining, in under three minutes, how salvation actually works. Recorded at Bethel Baptist Church on 2/20/11. Have you read a Christian book you did or didn't like? Please write a little review and send it to me. The Way of The Master has inspirational, entertaining and thought-provoking radio broadcasts and podcasts. The Way of The Master is heavy on evangelism and spreading the news about Jesus Christ.